In the modern world, everything comes in a handheld by the mobile. Through mobile, you can access everything in the world. To make it easier we develop Mobile Application in the business fields to expand and flow internally. At websitica, we are professional in the development of enterprise, educational and utility mobile apps. Our Mobile Application Development can solve business problems opens up new opportunities and makes you feel good. Mobile application is a preferred for foremost business houses because of the availability of low-priced devices and the easy way to drive applications into devices. Many restaurants, retail outlets, factories, warehouses, hospitals etc, have started using mobile apps for their interior applications. We develop apps for mobile phones that are either pre-installed on phones during manufacture, or downloaded by customers from app stores and other mobile software distribution platforms. At Websitica, we have developed software for the mobile application and web for mobile devices. This technology is helpful when integrating with existing web applications and when handling with huge data. 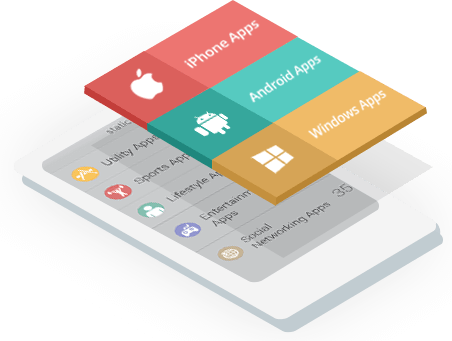 Any web application can be integrated into mobile apps using web service.At Websitica ,we make mobile application for Android,windows and IOS and release it into the market .